Do You Know Who Is The Most Qualified Person In India? Are you known to this man? If you are working personnel, then I want to ask you how many degrees you hold? Most of you will say 2, many of you will say 3, others can tell maximum 5. But, have you ever thought it could be possible for a person to achieve more than 5 degrees in his lifetime? But, today I am going to reveal you about a man who held more than 10 degrees, and he is an Indian. So you must be wondering who is the most qualified person in India. The answer is Dr. Shrikant Jichkar who was an all-rounder – academician, politician, painter, a professional photographer, and a stage actor. He is the Most Qualified Person in India. Dr. Shrikant Jichkar, who was a highly educated person with many achievements to his credit, was born into a Marathi family and hailed from a small hamlet in Nagpur. He not only has 20 postgraduate University Degrees but also he was bestowed with gold medals in most of them. He got his D. Litt (Doctor of Literature) in Sanskrit, the highest of any Degree in a University. Limca Book of Records lists him as the most qualified person in India. It is indeed sad that he was killed in an accident at the age of 50 on June 2, 2004. He also cleared IPS and IAS exams before entering into politics by contesting in General Elections. 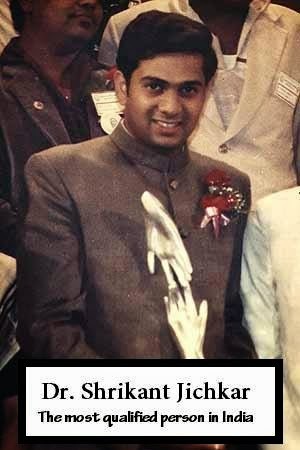 In the year 1980, around the age of 25, Shrikant was elected to Maharashtra Legislative Assembly, for becoming the youngest MLA in the country. Shrikant Jichkar used to handle 14 portfolios at the same time. He also served in Rajya Sabha for six years. He holds one of the biggest personal libraries in India with 52,000 books. How did he achieve such feat? He used to appear for the exams in every summer and winter. Between 1973 and 1990, he wrote for as many as 42 University exams. If you liked the post, then don’t forget to subscribe and share it with your friends!